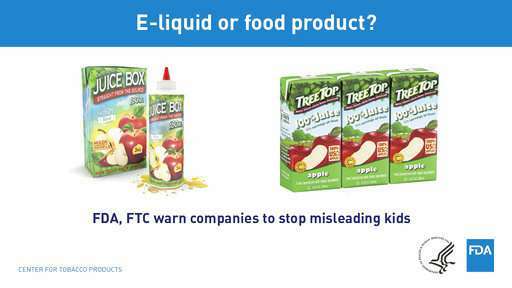 Federal health authorities issued warnings Tuesday to makers of liquid nicotine whose packaging resembles children's juice boxes, candies and cookies. The Food and Drug Administration said the packaging practice is illegal for vaping formulas and could lead to poisoning if children mistakenly drink the liquids, which are intended for use with e-cigarettes and vaping devices. Exposure to nicotine, even in small amounts, can cause seizures, coma and fatal heart problems in children. Some of the packages targeted by regulators look like juice boxes, Warhead candies and Nilla Wafers. "These are preventable accidents that have the potential to result in serious harm or even death," said FDA Commissioner Scott Gottlieb, in a statement. "Companies selling these products have a responsibility to ensure they aren't putting children in harm's way or enticing youth use." Warnings were issued to 13 manufacturers, distributors and sellers. Several companies were cited for illegally selling their products to minors. Such warnings are not legally binding but the government can take companies to court if the issues are ignored. Under federal law, people must be at least 18 years old to purchase vaping products. In some states the requirement is 21 and older. The action comes one week after the FDA disclosed a nationwide crackdown on underage sales of Juul e-cigarettes, which have become popular among some teenagers as a way to vape at school and in public. The FDA issued warnings to about 40 gas stations, convenience stores and other retailers for selling the devices to minors. Additionally, the agency asked manufacturer Juul Labs to turn over information about how it markets and designs its products, which resemble computer flash drives and work with nicotine flavors like mango, and "cool cucumber."